There are four reigning world minimumweight champions and you wonder who’s the fairest of them all. The WBC titlist is Thailand’s Wanheng Menayothin or Chayaphon Moonsri while the WBA king is another Thai, Thammanoon Niyomtrong or Knockout CP Freshmart. The IBF ruler is South Africa’s DeeJay Kriel and finally, the WBO beltholder is Filipino Vic Saludar who'll be honored as Co-Boxers of the Year with IBF superflyweight champion Jerwin Ancajas and IBO bantamweight titleholder Michael Dasmarinas at the Elorde Awards Night tomorrow. Menayothin, 33, is the most enduring of the four. He’s held the crown since 2014 and repulsed nine consecutive challengers. The Thai is scheduled to take on Japan’s Tatsuya Fukuhara in Chonburi on April 25 and it doesn’t look like he’ll be severely threatened. He’s beaten Fukuhara once before. Menayothin has a 52-0 record, with 18 KOs and no fighter ever has compiled as many wins without a loss sitting on the throne. Rocky Marciano’s record was 49-0. Floyd Mayweather is proud of his 50-0 and the speculation is he won’t risk a stain by taking on WBA welterweight champion Sen. Manny Pacquiao in a rematch. Mexico’s Ricardo Lopez retired in 2001 as IBF lightflyweight ruler with a 51-0-1 record, including 38 KOs. Four Filipinos failed to dethrone Menayothin----Jeffrey Galero, Jerry Tomogdan, Melvin Jerusalem and Pedro Taduran. Jerusalem, 25, gave the Thai his toughest test and if not for a point deduction in the eighth round for a low blow, would’ve held him to a majority draw in 2017. Jerusalem is ranked No. 2 by the WBC and knocking on Menayothin’s door for a second crack. His record is 14-2, with 8 KOs and Gringo’s only other setback was to Joey Canoy on points. Freshmart, 28, has a 19-0 record, with 7 KOs and has held the WBA belt since 2016, compiling seven successful defenses. Two Filipinos were thwarted in bids to take away Freshmart’s title----Toto Landero and former IBO lightflyweight king Rey Loreto. The WBA rates Loreto No. 10. Kriel, 23, captured the IBF diadem on a shock 12th round stoppage of Mexico’s Carlos Licona in Los Angeles last month. Licona claimed the vacant title by defeating Filipino Olympian Mark Anthony Barriga via a split decision in Los Angeles last December. Kriel lost a four-round verdict to Colin Tloubatla in his pro debut in 2104 but turned the tables in a rematch and hasn’t lost since. Last Saturday, IBF No. 4 Samuel Salva outpointed IBF No. 5 Rene Mark Cuarto in a minimumweight title eliminator to determine Kriel’s next mandatory challenger at the Resorts World Manila. Salva is also ranked No. 2 and Cuarto No. 8 by the WBO. 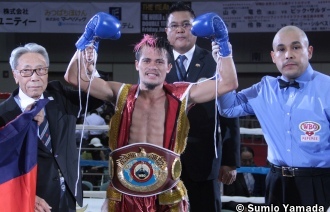 Saludar, 28, took the WBO crown from Ryuya Yamanaka on a unanimous 12-round decision in Kobe last July. He floored the Japanese once with a left jab-right straight combination in round seven and left him bleeding from a cut near his eye. Yamanaka, 23, was later diagnosed to suffer bleeding in the brain and announced his retirement from the ring. The Japanese said he had planned to fight until he was 30. Heavyweight Joe Mesi and WBC female superfeatherweight queen Frida Wallberg were other fighters who were forced to retire because of a cerebral hemorrhage. Yamanaka’s injury was listed by the London trade weekly Boxing News as one of three severe injuries in boxing last year. The others involved Gary Corcoran suffering a slight bleed in the brain from his fight against Johnny Garton and Adonis Stevenson going down with a traumatic brain injury from his bout against Oleksandr Gvozdyk. Saludar joins Pacquiao in the ranks of fighters who’ve sent opponents to retirement. Three victims whom Pacquiao retired were Oscar de la Hoya, Tim Bradley and Lucas Matthysse. After losing to Pacquiao, the three never fought again. In Saludar’s first defense last month, he trounced Masataka Taniguchi on points in Tokyo to raise his record to 19-3, with 10 KOs. His only losses were to Landero on a split decision in 2017, Kosei Tanaka on a sixth round knockout in a WBO title fight in 2015 and Powell Balaba on a fourth round stoppage in 2013. Menayothin, Freshmart and Kriel have tormented Filipinos in their rise to the top and it’s time for Saludar to exact revenge. The World Boxing Super Series has made inroads in its goal to crown a unified champion in every division, starting with the cruiserweight, superlightweight and bantamweight classes. The minimumweight division is ready for unification with Menayothin and Freshmart feasting on challengers to prolong their reigns. Menayothin has never fought outside Thai borders and Freshmart dared only once in China. Kriel hasn’t been tested and it doesn’t seem like he has the tools to be competitive against the Thais or Saludar. Why doesn’t someone influential organize a Super Series involving the four minimumweight champions with a substantial purse to make it worth the effort to unify? Recognizing four world champions is a farce. There’s only one world, one planet. And there should be only one world champion. Kriel could take on Menayothin and Saludar could face Freshmart with the winners advancing to dispute the unified championship. This will settle who’s the best minimumweight in the world. My money’s on Saludar to win it all.